MIDDLEBURG, Va. – April 4, 2016 – Salamander Hotels & Resorts, the luxury hotel management company founded by Sheila C. Johnson, today unveiled plans to renovate Hammock Beach Resort – a Salamander Golf & Spa Resort, located in Palm Coast, Florida. The oceanfront resort, the recipient of numerous accolades, will receive several upgrades: the elegant lobby will be completely refurbished, 75 spacious one-bedroom suites will receive an interior makeover, and the property’s expansive meeting and function spaces will be entirely refreshed. The Hammock House, the popular halfway stop on the resort’s famed Ocean Golf Course, is being also expanded. Renovation will be completed in stages and finished in its entirety by Labor Day 2016. Hammock Beach Resort will remain fully operational throughout the project, and work will be carefully managed to avoid any disruption. None of the resort’s outlets or amenities, including restaurants, spa and golf courses, will close. Renovations in the lobby include the installation of a beautiful new wooden floor, contemporary furniture and lighting, and a new bar. During this work, the front desk, coffee shop and gift shop will be temporarily relocated. The resort is also refreshing all of its indoor meeting and event space with new carpet, wall coverings and lighting. Maintaining the resort’s luxurious yet relaxed atmosphere, the one-bedroom suites will receive a complete décor upgrade, featuring modernized furniture, upholstery and linens, the installation of new carpet, updated artwork and the addition of new flat-panel televisions. Furthermore, the kitchenette within each suite will undergo reconstruction, featuring custom cabinets and refreshed walls. Located between the 9th hole and the driving range of the famed Jack Nicklaus Signature Design Ocean Course, the popular Hammock House is being expanded to feature additional outdoor patio seating overlooking the ocean, as well as more indoor seating and a small bar. The Hammock House will continue to offer ice-cold beverages and a variety of breakfast, lunch and snack items, specially crafted with the golfer in mind. 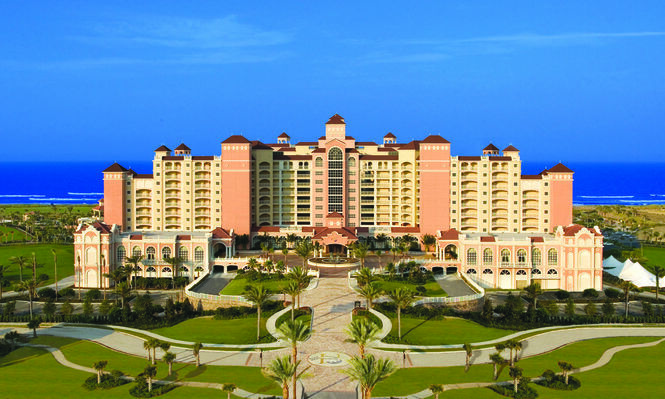 Nestled along northeast Florida’s shoreline in Palm Coast, Hammock Beach Resort features more than 300 spacious accommodations, including a 12-story tower of luxury suites. The amenity-rich oasis offers storybook experiences with two highly renowned and ranked golf courses designed by legends Jack Nicklaus and Tom Watson, a rejuvenating ocean-inspired spa and fitness center, multiple restaurants and bars, a multi-level pool complex with adult and children areas, and one of the most relaxing, unspoiled beaches in the state. Salamander Hotels & Resorts is a privately owned and operated company based in Middleburg, VA, just outside Washington, D.C. Founded by entrepreneur Sheila C. Johnson in 2005, the company has a portfolio that features a collection of three stellar Florida golf resorts including Innisbrook Resort near Tampa, Reunion Resort in Orlando and Hammock Beach Resort in Palm Coast; the luxurious Salamander Resort & Spa in Middleburg, a 340-acre equestrian-inspired property near Washington, D.C.; and the development and management of Henderson Beach Resort, a luxury beach resort with a 170-room hotel in Destin, FL; For additional information, call (540) 687-3710 or visit www.salamanderhotels.com.